This cycle company was founded by Enoch J. West in 1891. His first car was announced in 1899, called the Progress. It had a 2 1/2hp De Dion-Bouton engine mounted under the seat at the rear of a tubular frame with single-chain final drive. It was a 2-seater, but later Progress cars, with 4 1/2hp De Dion of M.M.C. engines had 4-seater vis-a-vis bodies and looked vey much like the comtemporary De Dion. 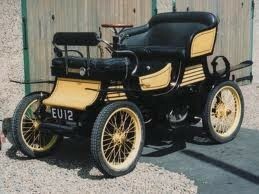 In 1902 a new model with pressed steel frame and front-mounted engines by Aster or De Dion appeared. The Progress company was in liquidation by the end of 1903, but the Aster-engined car re-appeared in 1904 basically unchanged and sold under the name West-Aster. About 150 vis-a-vis and 350-450 of the front-engined cars were made.